Protect valuable electrical cables, cords and hose lines from damage and abuse while ensuring a method of safe passage for vehicles and pedestrian traffic. Compact design is ideal for use in amusement parks, entertainment venues, sporting events, and in most public, commercial, industrial, construction, and utility applications. 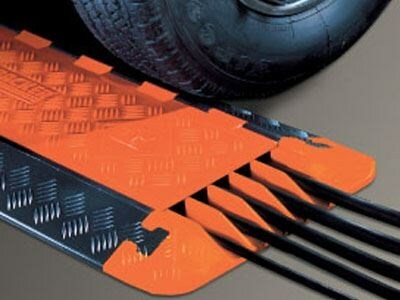 We also offer ADA compliant cable ramps and bridges to fit these cable protectors.